Astigmatism: Astigmatism is due to different curvatures of the cornea or an irregularity/tilt to the lens in the eye. It causes blurred vision and can be difficult to correct due to the different strengths needed in a lens to compensate. Post surgical cornea: Some people who have had complications from refractive surgery or penetrating keratoplasty may have irregular astigmatism due to an irregular cornea and cannot see well with spectacles. 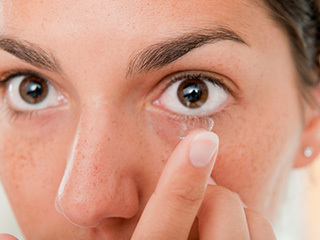 The only way to have clear vision is through a rigid contact lens, typically a scleral lens. Keratoconus: This is an uncommon condition that causes major discomfort when wearing contacts and blurred vision. Keratoconus happens when the cornea becomes thinner and allows the cornea to bulge forward. The bulge forms into a cone shape and causes irregular astigmatism. Again, being fitted with a rigid gas permeable lens, usually a scleral lens, will allow for good vision. Rigid gas permeable lenses are a good solution for patients who suffer from astigmatism, keratoconus, and any other irregular astigmatism from post surgical issues or other corneal dystrophies. A GP lens helps to smooth the optics of the cornea were good vision can be obtained. The comfort of a scleral lens compares to a soft lens and is a great option . Toric lenses are useful for correcting regular types of astigmatism. Since the lens needs to align to the optics it is correcting, toric lenses must not rotate in order to fit on the eye. They are typically custom made to correct a specific astigmatism. For that reason, this type of lens takes longer to make and costs more than a traditional contact lens. Medicated eye drops can be an effective solution for dealing with dry eyes. They will lubricate eyes enough to make contact lenses more bearable, and some drops can help inflammation and tear production. Another option is punctal occlusion which also keeps the eyes more lubricated.